Establish quaint and casual style in your home with this rectangular table. The dining room piece features a rustic oak finish as well as a laminate top while the double-pedestal legs provide a sturdiness. You'll be in for a fine dining experience with the assistance of this simple and clean table. The Cramco Motion - Atwood Rectangular Casual Dinner Table by Cramco, Inc at Town and Country Furniture in the Hamburg, Buffalo, Lackawanna, Eden, NY area. Product availability may vary. Contact us for the most current availability on this product. 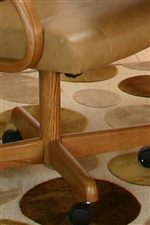 The Cramco Motion - Atwood collection is a great option if you are looking for Casual furniture in the Hamburg, Buffalo, Lackawanna, Eden, NY area.